PMC cyclists, volunteers, and supporters can still help raise money for the PMC by wearing their support on their wrists. With the limited edition PMC bead, specially designed by Confidence Beads™ to match the 2012 PMC jerseys, PMC supporters can continue to help raise money for cancer research and treatment at Dana-Farber Cancer Institute. Through Oct. 1, Confidence Beads™ will donate 20 percent of your purchase to a rider or PMC team of your choice. 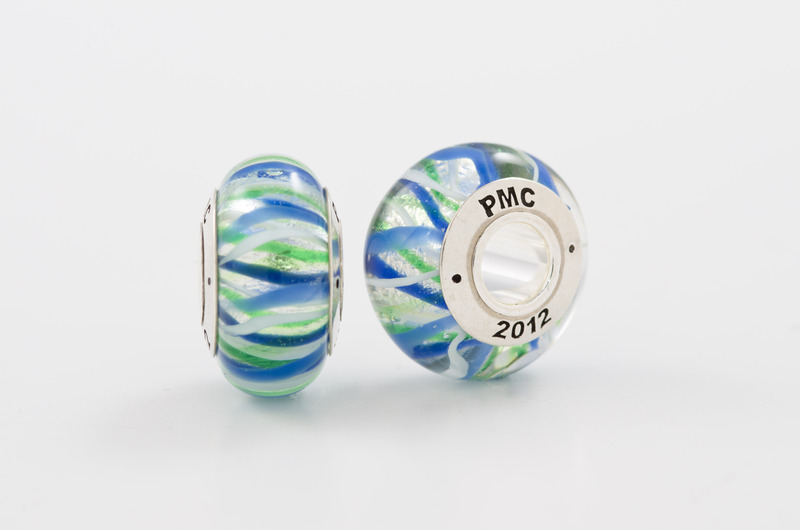 The PMC bead is made of royal blue, lime green and silver Murano glass and is inscribed with “PMC 2012” on both sides in sterling silver. The PMC bead costs $40 and will fit on any of today’s popular bracelets and accessories. When purchasing from the Confidence Beads™ website, buyers can include a PMC Rider ID number at checkout to ensure that their donation will go directly to that individual’s or team’s fundraising efforts. And don’t miss the bracelets made of bike spokes! 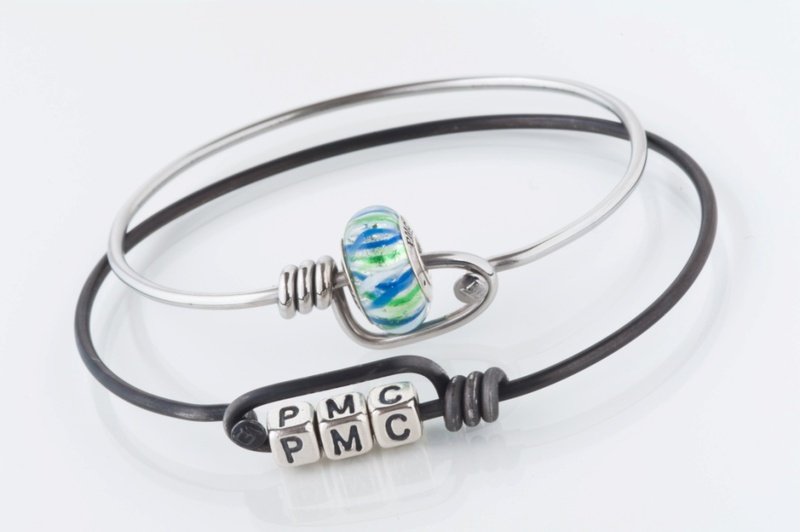 The PMC beads and bracelets are a great way to celebrate your accomplishment, thank your sponsors, or recognize and honor someone’s PMC achievement. In case you missed them in Wellesley and Sturbridge, you can go to http://www.confidencebeads.com/pmc.html to order your keepsake today! On Saturday, June 9, 33 cancer survivors who are PMC cyclists came together to celebrate the 33rd annual Pan-Massachusetts Challenge (PMC) and the Boston Red Sox Foundation’s 10th year as presenting sponsors of the PMC. Just hours before the game, Billy Starr, PMC founder and executive director, and Larry Lucchino, president and CEO of the Boston Red Sox, spoke passionately about the meaning behind PMC Day at Fenway Park and posed for photos with Red Sox wives, Stacey Lucchino, and Tiffany Ortiz. As trails of baseball fans took to their seats, a short video highlighting the PMC organization played on the JumboTron. Minutes later, PMC cyclists representing towns in Massachusetts, New Hampshire and New York rode their bicycles around the warning track as part of a pre-game ceremony during which PMC volunteers stood in front of the Green Monster to catch the falling American flag that unveiled the PMC logo. PMC Team 9 Pedal Partner and cancer patient, Tim Burke, posed with Billy Starr, Tiffany Ortiz, and Stacey and Larry Lucchino. To officially start the game, Diane Legg, 49, of Amesbury, threw the ceremonial first pitch. With the help of Wally the Green Monster, Joey Bianco, 14, of Natick, and Samantha Burns, 8, of Weston, served as bat kids. 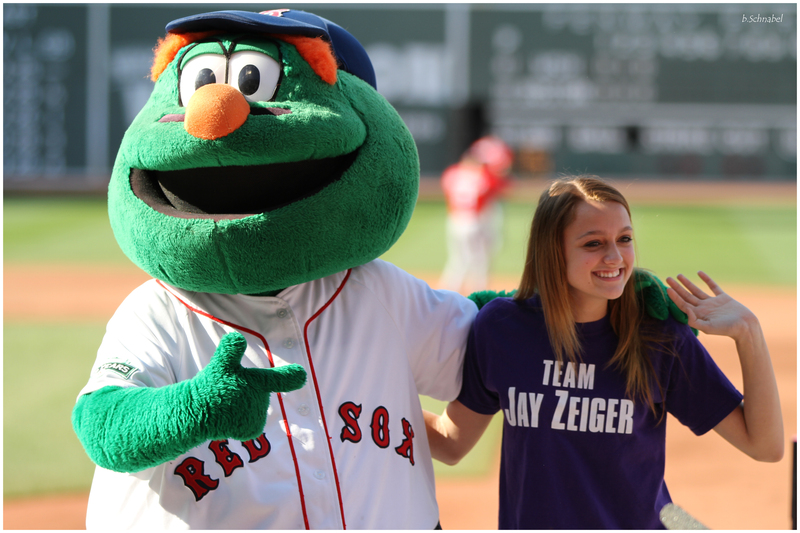 At the start of the fourth inning, Emma Zeiger, 14, of Needham, was honored by the Red Sox as a Child-Hood Hero for her outstanding contribution to her community as a member of the PMC family. As a special tribute, Bill Cantor, 88, of Swampscott, sat in Ted Williams’ Red Seat sporting a straw hat to commemorate the day in 1946 when the straw hat worn by Joseph Boucher, ofAlbany, deflected a ball hit by Ted Williams. Although the Red Sox lost to the Nationals with a final score of 2 to 4, PMC Day atFenwayParkwas an all around win. PMC participants were recognized for their hard work and dedication to the PMC mission as well as for their personal journeys overcoming cancer. Thank you to all our PMCers for participating in the event! Check out the full photo gallery here. What drives you to be a part of the PMC? The Massachusetts’ BMW Centers is inviting PMCers to be a part of the 2012 BMW Pan-Mass Challenge interactive photo mosaic. BMW is the official vehicle for the PMC. PMCers can submit photos and answers to “what drives you to participate in the PMC” by clicking here. The mosaic will be displayed online beginning June 1 and all photo submissions will be fully revealed on Saturday, Aug. 4 in the BMW Rider Village at Mass Maritime Academy, which serves as a finish line for thousands of one-day riders and as the half-way point for two-day riders. This hospitality area will be a place for riders to relax and recoup after their ride. It will feature a lounge, satellite TV and more. Be sure to share this page with other PMCers and to tag the photo to share on Facebook and other social media platforms. Send photos from past PMCs, photos of family or loved ones, or anything else that highlights your support of the mission of the PMC. Last year, hundreds of PMCers submitted photos to be displayed in the BMW Pan-Mass Challenge photo mosaic and it was a huge success. The 2011 mosaic can be viewed online here. Visit www.bmwmosaic.com to submit your photos today. The Pan-Mass Challenge’s $35 million raised and contributed to Dana-Farber in 2011 made the PMC the number one single athletic fundraising event in terms of funds raised in the United States, according to the annual Run Walk Ride 30 study released yesterday. The country’s top 30 “a-thon” fundraising programs generated $1.69 billion in gross revenue for charity last year, up $40.8 million from 2010, the study reported. The PMC has consistently been the top fundraising event in the nation since its 1980 inception. In terms of athletic fundraising organizations that host multiple events nation-wide, the American Cancer Society’s Relay for Life program topped the list with $415 million raised through 5,100 events with 3 million participants. Other single athletic charity events making the list included the AIDS LifeCycle, a 545 mile, 7 day bike ride along the California coast that had 2,300 participants and raised $13.3 million. The Ohio-based Pelotonia ride, founded in 2009 and modeled after the PMC, raised $13.1 million through its August event with 4,900 riders. Twenty three of the top 30 events, including the PMC, all saw their fundraising totals increase from 2010 to 2011. Click here to see the full report from The Run Walk Ride Fundraising Council. Watch the New England Patriots take on the Baltimore Ravens on Sunday, Jan. 22 in the AFC Championship game — and support the Pan-Massachusetts Challenge. Fallon Ambulance has donated a VIP Ticket Package for the AFC Championship game at Gillette Stadium in Foxboro including four tickets and a VIP parking pass. Proceeds from this online auction will support the Pan-Mass Challenge. Click here to bid on the auction. 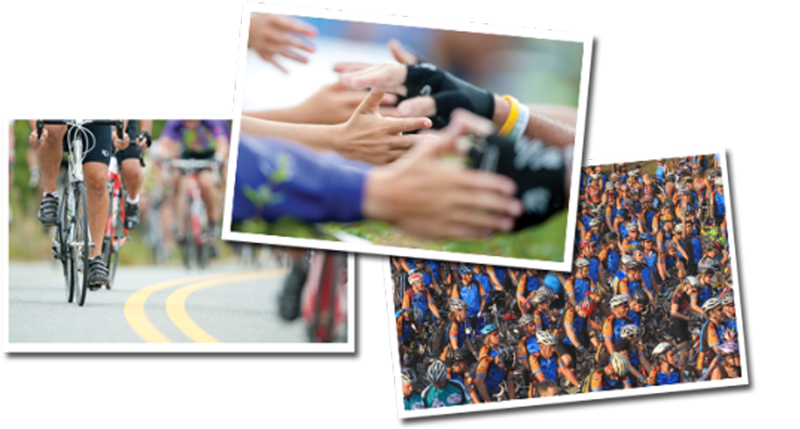 More than 900 people have already registered to ride in the 2012 Pan-Massachusetts Challenge. Now it is your turn. Registration is now open for all PMC alumni. Visit PMC.org to register to ride one of 11 routes in the 33rd annual PMC, set for Aug. 4 and 5. Join us as the PMC rides toward a record fundraising goal of $36 million for cancer care and research at Dana-Farber Cancer Institute. Register now to secure your chosen route and your spot on the ferries out of Provincetown. Click here for all of the PMC logistics info. It’s going to be another GREAT PMC year.